Space Firebird is a one or two player game in which players are attacked from all sides by highly maneuverable Firebirds. 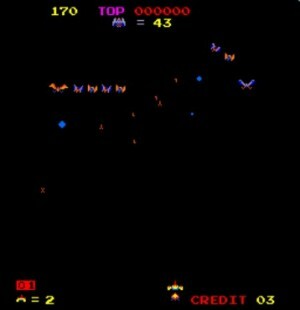 Players can move space ship left or right and shoot a rapid-fire laser at attacking Firebirds. A special Warp Mode allows the space ship to escape danger and fire at the flock of aliens. The space Firebirds are a unique set of adversaries. There are three different birds, the Emperor, Eagle and Gull, which fly together in complex looping formations, firing and attacking from all directions. The player must keep track of the laser hits because each bird has a different resistance level to hits. The fearless Emperor is destroyed by four hits, the Eagle with two hits and the soaring Gull with one hit. The Eagle also has a deadly bomb which is launched at the space ship. Extra points are scored by hitting the bomb before it explodes. The bomb when hit, scatters into deadly shrapnel. To avoid the flying shrapnel, the bomb must be hit from directly underneath. The space ship can be moved right or left to evade attacking Firebirds. Depressing the fire button enables the space ship to shoot its laser at approaching Firebirds. Players receive 3 (adjustable) space ships per play. Activate warp mode to escape impeding danger or to strike out at approaching birds. There is only warp mode per space ship. When activated, the space ship is launched into space with a force field around it that deflects enemy fire. In warp mode, Firebirds can be eliminated by ramming into them or by firing at close range. If all Firebirds are destroyed, the player moves into a new battle sequence that increases in difficulty. One new space ship is awarded for a score of 5,000 (adjustable) points. Game ends when all space ships are destroyed.